That does mean we nearly made it through the whole thing without getting dragged in, but if we’re going to get sucked into a spinning vortex of nerdiness it may as well be by something as cool as this. It’s called the Lone Eagle, it comes from Flickr’s F@bz, and it features more ingenuous building techniques than would normally be found in a whole month of spacey nonsense. Click the link above to head to F@bz’ photostream to check it out. …Or something. As regular readers of this site will know, space is not one of our limited strong points, so we won’t try to describe this ‘Vespine Vic Viper’ by Flick’s billyburg. What we will say is it has a smiling Classic Spaceman at the controls and we like that very much. Swoosh over to billyburg’s photostream to see more. With the end of mysterious Ma.Ktober, the roll of sci-fi themed months continues through the darkening nights with NoVVember. 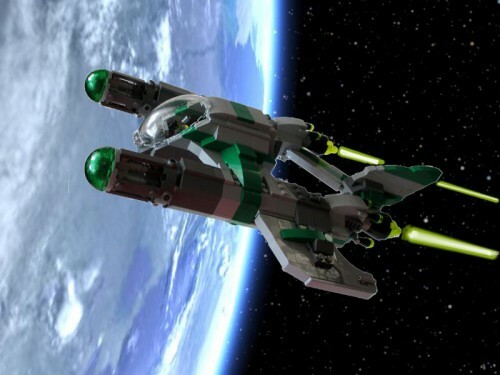 Builders from all over the interweb take a basic set of rules for the layout of a space-fighter, based on Konami’s Vic Viper and stretch them almost to breaking point. A case in point is TLCB regular Piratecox’s Herbie Rod Viper Classic: it’s all in there somewhere! In the meantime, another TLCB regular, F@bz, has come up with a ship which looks suitable for a Milk Tray Man of the Future. Controversially, this Vic Viper uses (whisper it) parts from Mega Bloks. This might be heresy to some but the inspiration behind NoVVember, the late Nnenn, often used clone parts or cut Lego to fit his models. You can make up your own mind by following the link in the text. Back in the days when the Royal Air Force spent as much on moustache wax for its pilots as it did on jet fuel, three mighty bombers were designed. The Valiant, Victor and Vulcan. The latter two were aerodynamically advanced for their time*, with the Vulcan’s huge delta wing looking particularly graceful in anti-flash white. Powered by four Rolls-Royce Olympus engines, Vulcan XH558 still wows the crowds at shows today, whilst also reminding us the dark days of the Cold War. If they had continued this series of aircraft, would British designers have used the name “Vendetta”? It is certainly appropriate for this sleek, aggressive looking craft from American builder Tim Clark. 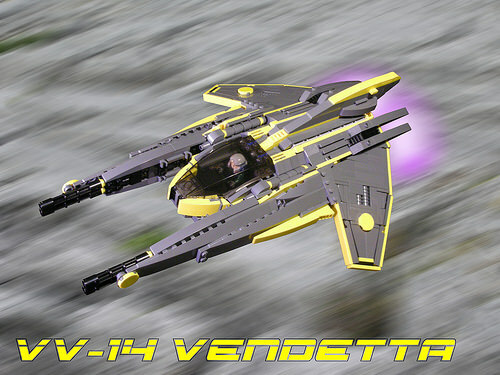 Tim’s Vic Viper includes a spacious cockpit, angled brick built wings and highlights in Lego’s latest shade of yellow. You can see more of this ship on Tim’s Flickr Photostream. It’s a fairly certain bet that the Ministry of Defence would never have chosen the name “Valium” for a bomber. According to its creator, Stuart Lucas, a big feature of this ship was the first ever coffee machine designed to work in zero gravity. Stuart cites influences from those other vintage Cold War jet aircraft, the twin boomed de Havilland Vampire & Venom series. Click this link to Stuart’s MOCpages to see more of this unusually shaped Vic Viper. *The Elves have just tried to eat Kuchmen’s Carrots. Novvember is finally over, so until the next tenuously titled month-long bandwagon rolls into town here’s one of the last creations uploaded to the departing theme. Tim Henderson‘s Lightning VicQueen shows what Disney’s anthropomorphised racing car would look like if he was born a few hundred years later. You can check him out on Flickr at the link. We have a well documented ignorance of almost everything sci-fi here at TLCB. Cars we can do, swooshy spacey stuff… eh, not so much. 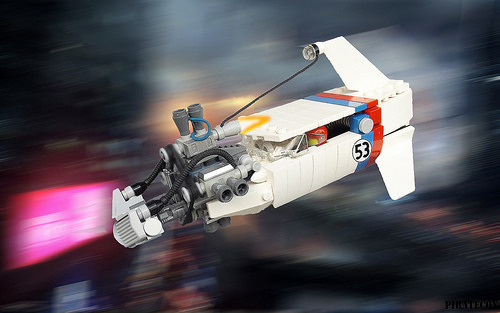 This funky looking spacecraft by Mark Stafford (a LEGO employee no less!) will probably be picked up by the more sci-fi biased blogs soon, who’ll do a far better job than us explaining what it is, so we’ll just jump straight to the link! – Click this to see more! We’re outside of our blogging comfort zone again, publishing some sci-fi that we don’t understand. Still, whatever this is looks cool and you can see more of it at sylon-tw‘s Flickr photostream. This marvellous slice of blue sci-fi is the work of Flickr’s Nick Trotta (aka tardisblue). Part of the NoVVember* ‘Vic Viper’ theme month, you can see more of Nick’s ‘Solar Striker’ and his other creations at the link above. *We’ll let the other Lego blogs explain / endorse the rules in this month’s bandwagon. We would, but we don’t care for rules. We’re rebels. It’s Novvember in the LEGO Community, which means it’s Vic Viper building season. At The Lego Car Blog we’ve stayed clear of the VV obsession a little bit, as there are other sites that do this sort of thing way better than us, and it can get a little snooty, with originality sometimes taking a back seat in order to follow the VV ‘rule book’. We can’t be bothered to read the rules (which may be the real reason behind our abstention! ), so we have no idea whether this creation qualifies, but we do love it regardless! Built by Xtopher Brick on MOCpages, this ‘Skeleviper’ looks like a cross between TRON and Funny Bones. Check out the full gallery by clicking the link.